Non-threaded Quick-Release Ball Plunger design push-fits into hole. 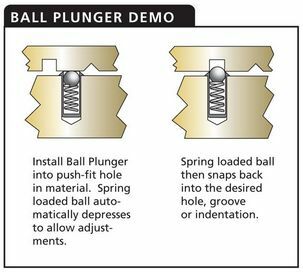 Spring loaded ball detent forms a bearing surface which retracts and then snaps into opposing hole or groove. Push fit Ball Plungers are used for locating or positioning in drawers, doors, dies and other fixtures. Also known as Ball Detents, Spring Loaded Plungers and Spring Plungers. Specials available in a variety of sizes, materials and finishes. Standard sizes are low carbon steel, black oxide finish, as shown below. All ball plungers are made-to-order. 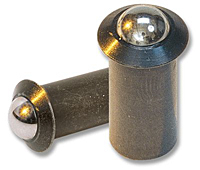 Design a Pull or Ball Plunger made to your exact specifications! We offer free engineering assistance and samples! Specials available in a variety of sizes, materials and finishes. Stock sizes are low carbon steel, black oxide finish.